Chittagong is not directly a historic biographical film about Masterda Surya Sen. It is more about the revolutionary sensitivity than about the life of a freedom fighter who fought for Indian independence. Khelein Hum Jee Jaan Sey, another film on the same theme of Chittagong Armoury Raid is a Hindi period piece film based on the book Do And Die by Manini Chatterjee, directed by Ashutosh Gowariker. Bedabrata (Bedabrato) Pain’s debut film Chittagong transforms an apocryphal historical anecdote into a passionate cry for freedom which resonate in the soul of a teenager. The world premier of film occurred on April 10, 2012 at Los Angeles film festival and it is set to be released on August 14 in India. The name of Masterda iconises fight against the British Raj. Surya Sen was initiated into the revolutionary world in 1916 by one of his teachers while he was a student of BA Class in the Behrampore College. On his return to Chittagong in 1918, he became the President of the Indian National Congress. He revived the hardline patriotic organization including Jugantar in different parts of the Chittagong district. He was convinced of the need for secret guerilla warfare against the Colonial government. 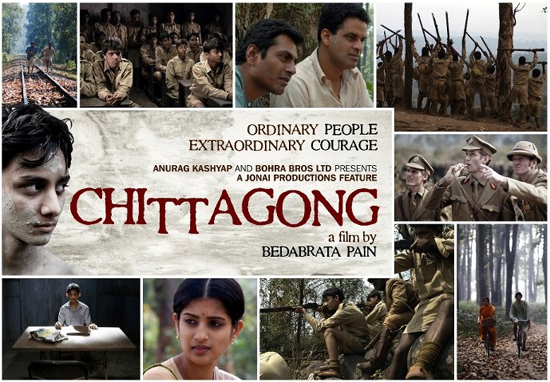 The Chittagong Armoury Raid of 1930, a little known saga related to the British-occupied India is at the backdrop of Bedabrata Pain’s debut film Chittagong, but it is more than a political movie. As in Raja Rao’s Kanthapura, the character of Moorthy represented Gandhism, in a similar way, the boy Jhunku played by Delzad Hiwale accepted the discipleship of Masterda whose name was synonymous with revolution against the British Raj. Pain deliberately did not depend on one particular book. He studied varied sources including the anecdotes related to the Raid and talked to many people In a word. The film is the outcome of a long academic research. He made Jhunku and not Masterda to play the lead role. Mulk Raj Anand introduced the character of Mahatma Gandhi but Raja Rao in his Kanthapura did not do it. This is also true of Bedabrata’s film. Jhunku is here the alter ego of Masterda who himself was inspired by his teacher to join the freedom movement. Masterda Surya Sen (Manoj Bajpai) dared to take on the Empire with a group of schoolboys and young women and a few colleagues. But this story was secondary and multiple perspectives enrich the plot. The diffident 14 year old boy, Jhunku coming under the spell of Masterda seems to be more important in the film. Chittagong has a psychological base and the story of Surya Sen Masterda is in the distant background more as a myth for the 14 year old boy. It is a vague myth reflecting the aspirations of the youth who are maddened by the desire for Freedom like Moorthy of Raja Rao’s Kanthapura. Here are beautiful scenic shots showing the broad day robbery at the treasury office of the Assam –Bengal Railway at Chittagong. Persuasive period details and competent filmmaking are not enough to overcome the predominantly self-conscious writing and unimpressive performances either, rendering the film more passing curiosity than epic milestone. Many history books depict the Chittagong uprising as finished when Master Da gets killed but 90% of the people who took part in Chittagong struggle actually survived and participated in many more struggles. Master Da's character was one of the most difficult characters to portray chiefly because, Master Da's character is inspiring like that of Subhas Bose, another real person whose life is shrouded in mystery. Everybody in Bengal knows about Master Da, and Pain very rightly as a director chose to show a positive aspect in the film on the Chittagong uprising. He does not leave the audience unsatisfied with the sense of a glorious defeat. The film’s essentially anecdotal material and youthful point of view, however, cannot generate sufficient excitement or gravitas to fashion either an all-out action-adventure or a sweeping epic. Pain also elaborately portrayed the rather vague historical incident to focus the success rather than the defeat in the Armoury Raid of 1930. It was the first anti-British. Revolutionary violence and the camera had its distinct focus on it. The 1930 Chittagong Uprising was among the first events to challenge colonial authority, setting the stage for India’s independence in 1947. People who are inspiring, who think that the world can be changed - Master Da was one such character. He dared to dream that the mighty British Empire can be defeated militarily. All these are chronicled in the film Chittagong and people will enjoy them both in Bangladesh and India. The most interesting part is played by Surya Sen’s alter ego Jhunku, the teenager boy who is running clandestine errands and undergoing training with the rebels’ few functional rifles. The victory is short lived because of the lack of military experience and a shortage of arms. It is by sheer courage that the group raids the local British garrison, sending the troops packing. The quick arrival of reinforcements make the insurrectionists totally at a disarray. They found confronting forces far beyond their expectations. Faced with seemingly insurmountable odds, Jhunku must make a choice between his commitment to liberty and surrendering to British authorities. Herein lies the topicality of the film and also its success. What is more important about Pain’s film, is that it is a celebration of present not history. 'Chittagong' is very topical as it reminds us of what's happening today. While many associations surrounding India’s liberation from Britain center on Gandhi and the nonviolent independence movement, in fact it was a long series of political and social developments that eventually expelled the English. Pain focuses on the true story of the life of a revolutionary and at the same time hinted at the long process that continued even after Masterda’s courageous fight. The Bengali director of the film, Bedabrata Pain was in IIT Kharagpur, and was brilliant student with a perception of his own. Later he went to Columbia University for his Ph.D. Pain, who had been a senior research scientist at NASA was one of the inventors of the active pixel sensor technology that produced the world's smallest camera. The basic digital camera technique is used in mobiles today. He has been inducted to the US Space Technology Hall of Fame. Later he worked for NASA for 18 years. The former NASA employee wrote 36 drafts of his film 'Chittagong' before taking the first shot. He demonstrates a flair and passion for filmmaking. He managed to read writings by various participants of Jalalabad battle like Suresh De. Chittagong is pivotal to Bangladesh as it is to India. Most of the historical films end in a defeat. Take 'Mangal Pandey-The Rising' or 'The Legend of Bhagat Singh' for example. As in Rajkumar Santoshi's film, there is the sense of defeat when Bhagat Singh gets hanged. But in Pain’s film, the audience is left with a sense of victory. According to Pain, Masterda achieves an amazing triumph which is sometimes not even recognised because Chittagong uprising really did not end in 1934. Here it is more than a political movie and a celebration of triumph rather than defeat. It is unfortunate that the release of the film was delayed because of Ashutosh Gowariker’s Khelein Hum Jee Jaan Sey starring Abhishek Bachchan and Deepika Padukone in the lead roles. Anurag Kasyap accuses the Big B of delaying the release of the film. The producers Anurag Kasyap and Sunil Bohra are even toying with the idea of releasing it on August 15 in India although it was ready for release on August 10. The film will feature music by trio Shankar Ehsaan Loy and Resul Pookutty will do the sound. Delzad Hiwale plays the role of Jhunku and Barry John is impressive as Wilkinson. Vega Tamotia played the role of Pritilata Waddedar. Besides there are Nawazuddin Siddiqui to play the role of Nirmal Sen, Raj Kumar Yadav as Lokenath Bal, Jaideep Ahlwat as Anant Singh, Dibyendu Bhattacharya as Ambika, Vishal Vijay as Ganesh Ghosh and Alexx O’Nell as Charles Johnson, all of whom make the character cast vivid and effective. In this kind of film the role of the costume designer is very important and Neelanjana Ghose did her job very well. Dialogues written by Piyush Mishra are attractive and marked by dramatic intensity.